So, in spite of all my hemming and hawing about trying to whittle down the WIP pile, it turns out I really needed something new on the needles. This shawl is a new design I initially started working on back in 2016, and I got pretty far into the second skein of yarn when I realized that it was much darker than the first one. So I ripped it all out, balled it back up, threw away my chart and notes, and ignored it for a year and a half. I still love the idea though, and enough time has finally passed that I'm ready to tackle it again, this time alternating skeins. Last night I re-drew up my charts, wrote myself some notes, and started knitting. I'm just as charmed by this as I was the first time I tried knitting it, and it feels really good to be knitting a lace project again. My hope is that having this to alternate with some of the WIPs I really want to finish up will keep me going. 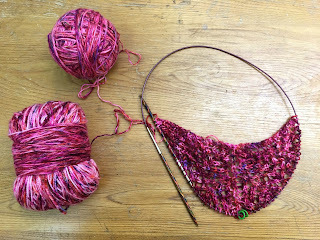 It's so easy to hit a wall in crafting, especially when projects have languished for a while, and I'm really glad that something as easy as pink yarn and some yarn overs can bring me back to life.